A historic Flagstaff steakhouse gets a new image. After opening in 1975, The Horsemen Lodge quickly became a popular Flagstaff hangout for Babbitt cowboys working on the CO Bar ranch. The steakhouse—named “Horsemen” in the effort to pay homage to the ranching lifestyle—is decorated with authentic cowboy attire, memorabilia, and artwork. 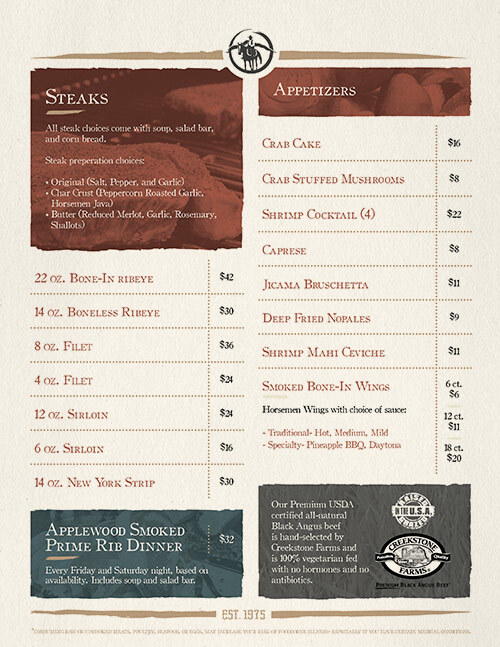 In 2014, the steakhouse was sold to new ownership and Rare Dimension was approached for a complete brand overhaul, including the logo, restaurant menu, and website. 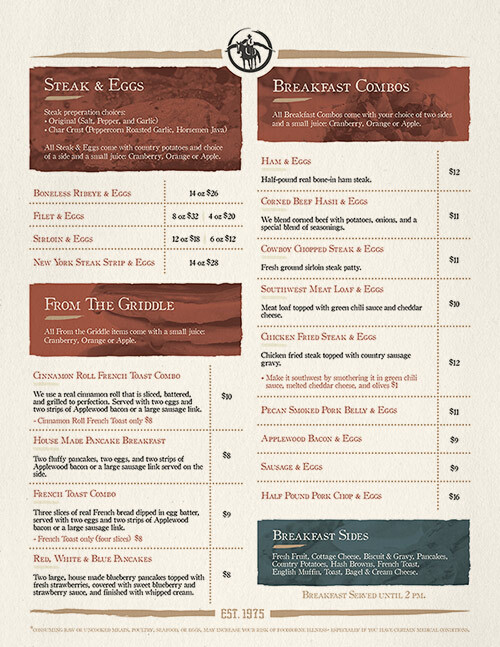 The site is divided into a clean grid layout, featuring sections aimed at Horsemen entertainment, food, and its extensive history in Northern Arizona. The entire site is scalable to both desktop and mobile usage, allowing curious customers to explore restaurant and menu offerings on any device with ease. Anchor links on the menu page allow users to "jump" to various menu headings for quicker navigation. Reservation and contact pages allow users to get in touch with management while also eliminating spam email through clever plugins. The original Horsemen Lodge branding had a nice vintage aesthetic, but it was far too busy for the signage and print materials. Influences were pulled from old and new western themes, including vintage photos of cowboys, ranch cattle brands and family crests, and the lodge's history in Flagstaff. The logo includes the silhouette of a cowboy in traditional garb with the outline of Mt. Elden situated behind him- another nod to the lodge's location in rural Northern Arizona. A bold all-capitols gothic style serif font compliments the icon on signage and other branded materials where the Horsemen Lodge title accompanies the logo. A clean 2-column layout with a simple 4-color palette was established incorporating straight and jagged lines together to give modern appeal while also hinting to the Horsemen's "rough-and-tumble" cowboy attitude. 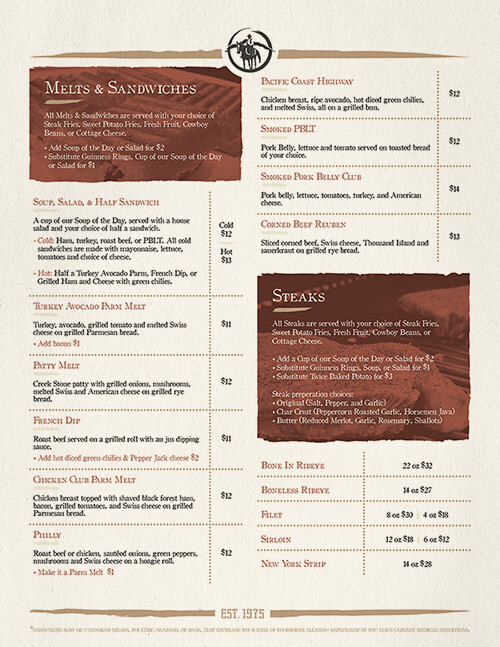 Each menu section begins with a clear heading along with a backing image using color accents to showcase a featured image and plate information. Rare Dimension also consulted Horsemen Lodge on selecting leather-bound menu covers and rustic off-white textured paper for the final printing and final presentation in the restaurant.